happy new year! i hope you’re having a great start to 2014. it feels like it’s been years since i’ve posted anything. i traveled for much of november and december. i’m home for awhile now, so expect the posts to come fast and furious (or not depending on my laziness / extremely active social calendar. ps that last bit is a joke). one of my travel destinations in december was nyc for a day and half. 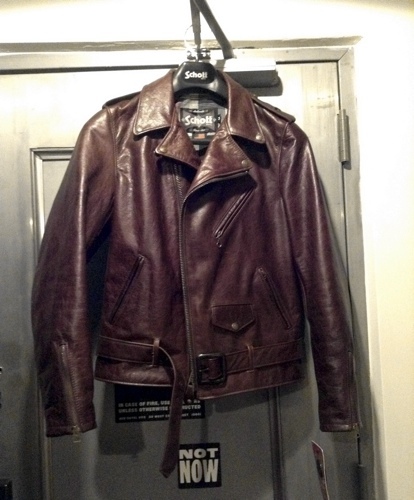 i had one goal in mind while in the big city: visit schott and buy a leather jacket. mission accomplished. i made the pilgrimage from the ace hotel (who’s hip now) to schott as soon as i got my bearings. i went into this mission thinking i was going to get a 613 like the ramones used to wear, but they didn’t have my size. it’s a good thing too because the salesman grabbed a 626 and told me to try it on. i did. it felt like home. i asked if they had a black one and he said they wouldn’t be available until late february. 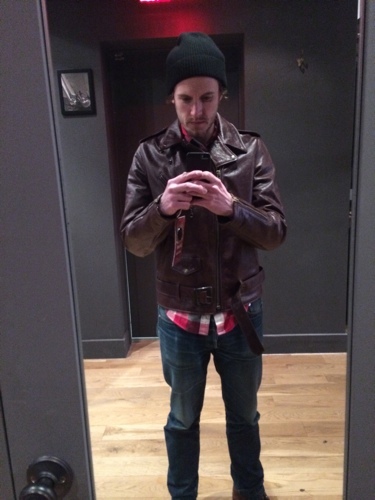 f**k. i didn’t want to wait, but i also didn’t want a brown leather jacket, so i did what any smart shopper would do in late 2013: i took a “selfie” and sent it to the lady friend. she insisted i get the brown, because “black is not really me” and “brown is unexpected.” damn she smart. the big difference between the 613 and the 626 is the weight of the leather. the 626 is much lighter meaning you can actually put your arms down from first wear on. the only other difference my untrained eyes could see was that the 626 has a snap down collar. i’m a 36-38 jacket size depending on the brand and went with a medium. it fits like a glove as you can see below in the dreaded “selfie” i did not want to post. if you’re in nyc and in need of a badass jacket, go see the good people at schott on elizabeth street. they were the nicest sales team i encountered while on my trip. if you happen to catch this post, thank you for taking such good care of me. i will definitely be back.